Sura al-Qasas (28) :5 (English): And we wished to be gracious to those who were being oppressed in the land, to make them leaders and make them heirs. The above verse constitutes one of the foundational beliefs on which the organization of Hizbu'llah draw. There is an all too common misconception, perpetrated by so-called journalists--who write copy using the worst sort of cliches to lock certain mental images into their readers' minds, that Hizbu'llah is a fundamentalist sectarian and terrorist organization. 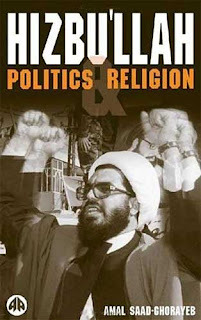 Two relatively recent books help to dispel this notion by placing Hizbu'llah's accomplishments within the framework of Shi'ite political mobilization, the political opportunities offered by the civil war, and the heteregenous nature of Lebanese society. Each book shows the development of Hizbu'llah from a guerilla movement who at times engaged in what the international community deemed as acts of 'terror' into a full-fledged political party with a stake in Lebanese politics. The first book, by former U.N. observer Augustus Richard Norton, is a short but authoritative account of Hizbu'llah's development in the context of recent Lebanese history. It has the advantage of including some analysis of the 2006 war with Israel, in which Hizbu'llah emerged from a devastating bombardment organizationally intact. The second book is an older account by a Lebanese insider, based on interviews, televised speeches, and an excellent review and critique of the secondary literature about the organization. Amal Saad Ghorayeb analyzes Hizbu'llah through the paradigm of 'oppression' and sees Hizbu'llah as a theologically flexible, guerilla movement which stands ideologically on the side of the oppressed. This is a helpful paradigm, because it sees Hizbu'llah as basically responding to opportunities to organize people against oppression, using Islam as an idiom, not as an Islamic movement to 'Islamisize' Lebanon and the world. Hizbu'llah's mission (if not always its tactics) stand in the best traditions of Islamic liberation theology, and are fundamentally consistent with Biblical teaching about God's special concern for the poor (see Matthew 5:5 for the Biblical precursor to the Islamic idea). One thing both authors stress is the evolution of the party, from a entity existing outside of the system, to a major player on the Lebanese political scene. Hizbu'llah's challenge will be to remain relevant to its mass base and yet manuever within the convulutions of Lebanese politics without being corrupted by the alliances it forges.